In a Nutshell: Credit card payments have come a long way since the early days when card imprinters etched card numbers onto carbon paper to today’s swipe-and-go methods. Getting to this point has taken a lot of hard work to advance technology and find solutions that work well for both businesses and consumers. 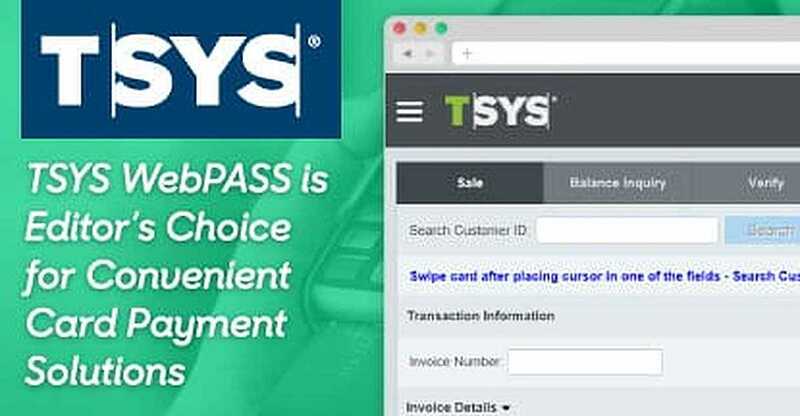 With its WebPASS virtual terminal, TSYS provides a convenient product that makes accepting multiple types of payments easy for the back-office industry and beyond. For WebPASS’ impressive features and ease-of-use, we are recognizing TSYS with our 2018 Editor’s Choice Award™. The internet is so pervasive in our daily lives today that it can be easy to forget that besides offering us a constant barrage of food photos, cat videos, and rage-Tweets, it has actually brought about some elegant solutions to clunky processes in our lives. A credit card payment made as recently as the ‘90s seems like an incredibly antiquated system in today’s connected world. A clerk would disappear behind the counter and return with a metal-and-plastic machine about 12 inches long by 6 inches wide. He would align your credit card to the corner guides attached to the machine, lay a rectangular stack of papers across the top of the card and KR-CHHUNK — push the large slider across the card and back to its original position. He would then hand you the paper, now etched with your credit card number, to sign, after which he would tear off one sheet for the company and give you back one sheet for your records. Ultimately, all the other signed credit card receipts the clerk would receive that day were collected and mailed off to the credit card payment processor for the payments to be settled with the bank. Today, consumers can simply swipe or insert their chip card and be on their way, thanks to major advances in credit card payment processes over the past couple of decades. Companies like TSYS are continuing to improve this process for businesses by making it easier than ever for merchants to accept a variety of payments from customers. One of the recent additions to its suite of payment solutions caught our eye. We explored the TSYS WebPASS virtual terminal and were impressed by its wide-ranging functionality, security features, and convenience it brings to businesses and consumers alike. For these reasons, we are recognizing TSYS with our 2018 Editor’s Choice Award™. The US Department of Commerce announced in 2017 that e-commerce accounts for more than $394 billion in business in the US. That’s huge. And the e-commerce market is continually growing. Businesses need to not only stay current with their payment processing methods, they need to be at least a step ahead, as the market and technology continually evolve. That’s where TSYS WebPASS comes into play, said Christina Ziegler, Vice President of Product for TSYS’ Merchant Solutions Segment. The program can accept Visa®, Mastercard®, Discover®, and American Express® credit and signature debit cards at the same rate, and can also process ACH payments. Ziegler said the need for virtual terminals originated from back-office environments like dentist or doctors’ offices, where they were frequently receiving payments in the mail or taking payments over the phone. She said merchants can plug in a wedge reader to swipe cards using the magnetic stripe, and TSYS recently added a chip reader option as well. “That allows the merchant to have card-present rates, and obviously the security the chip brings,” Ziegler said. Ziegler said the card-present and card-not-present capabilities have opened up WebPASS to any type of use in a retail environment, although many of its merchants remain in the back-office environment. But she said WebPASS is seeing an increase in B2B users, and it also offers the ability to process Level 2 and Level 3 transaction data, which applies to corporate cards or government cards. 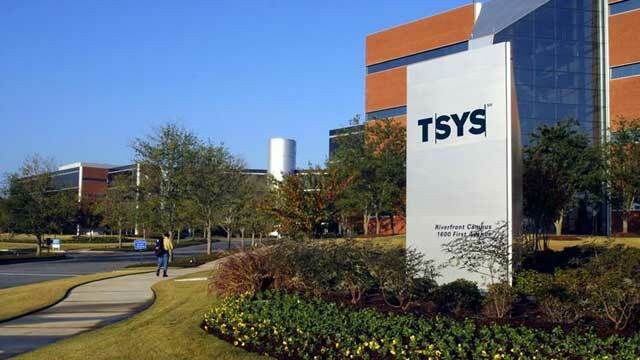 Ziegler said with any technology TSYS develops, it focuses on three cornerstones: scalability, stability, and security. WebPASS also employs what Ziegler called tokenization. This allows card numbers to be stored securely for recurring billing using a proprietary TSYS tokenization algorithm. Essentially, if card data is breached when it is in its tokenized form, it will be useless to any outside entity, ultimately protecting the consumer from card fraud. She added that once encrypted data is safely received by TSYS, it then employs a decryption key to decode it and process the payment. Ziegler said WebPASS is embedded into a broader back-office tool from TSYS called Merchant Center. “Merchant Center and WebPASS are kind of one utility,” she said. WebPASS is where the merchant accepts payments and other transactional components occur, she said. Christina Ziegler is Vice President of Product for TSYS’ Merchant Solutions. Ziegler said a benefit of how the two programs integrate is that each user can be assigned specific permissions through Merchant Center, and then a user can log in individually through WebPass as long as there is an internet connection. Various permission levels might include the ability for a user to issue refunds up to a certain amount or access some limited reporting. Ziegler said that flexibility and customization level takes place within Merchant Center. Reports are very customizable within Merchant Center as well, she said. Merchants can pull the report themselves, or have TSYS push the data to them on a daily basis. Merchants can also choose what data is included in the report. Merchant Center essentially serves as an administrative and reporting hub where merchants can have all customer and transactional reporting details easily accessible, and merchants can readily account for all payment processing transactions, according to the TSYS website. “So, again the Merchant Center component coupled with WebPass is what creates this powerful merchant solution,” Ziegler said. Ziegler said TSYS is also in the process of increasing WebPASS’ functionality by adding an electronic invoicing component. She said the new features will not only be about sending out an invoice, but also managing invoices, and creating a simple user experience for paying invoices. Just as the grating jumble of bleeps and bloops we used to hear as our old landlines connected us to the internet, the old KR-CHHUNK sound of a credit card imprinter is virtually obsolete in today’s world. And fortunately, companies like TSYS continue to carry us into the future with secure and convenient payment solutions for an ever-expanding e-commerce environment. Matt Walker is a Contributing Editor for CardRates.com and published author with more than 15 years of experience in writing, editing, and strategic communications. Matt uses his extensive background in journalism and communications to interview and report on industry influencers and leading voices in the world of finance. His in-depth knowledge and straightforward language are well known for making difficult subjects easy to digest. He also enjoys highlighting valuable resources and technology that can help put consumers on the right path to make better financial decisions.